The album is titled ‘The Hunting Room’ after the room in Castletown House where it was recorded. The album features traditional music played on concertina and fiddle with no accompaniment. The repertoire is from Anglo-Irish music collections plus newly composed music in a similar style. 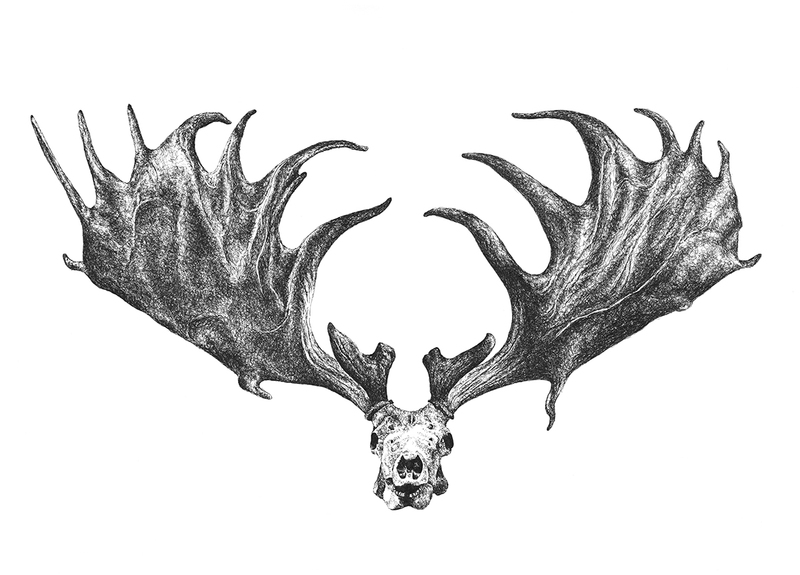 Ciaran and Aifrik wanted an extinct Irish elk to symbolise the magnificence of the Anglo-Irish big houses, their high-society occupants, and their subsequent decline. I went to the Natural History Museum to photograph the Irish elks. I used these images to draw from in a pen-drawn scribble style referencing early zoological drawings. The front cover uses the pen illustration colourised to a pink shade found in some of the Castletown House damask wallpaper. A period typeface and printing direct to recycled card continue the reference to zoological specimen sheets. The CD is printed in pink with the antlers of the Elk in black. For the inside cover, I chose images from the commissioned photography that had a frank directness that reflects the sparsity and atmosphere of the music. The placement of the faces half-off the page and at opposite sides highlights them as separate instrumentalists, but the mirroring of the layout and the eye line brings them together as a duet. The back cover features one antler set in the background, with the track information over this.